Unique gift idea: Print your own Mathaeneum designed sculpture! Turn your mathematical designs into three-dimensional reality. Email additions@momath.org for more information. Fri, Feb 26 Family Fridays at MoMath presented by Time Warner Cable: "Coloring Outside the Sines"
Wed, Mar 9 Harmonic Series "Sam Zygmuntowicz: The Math, Science, and Art of Violin Making"
Sun, Mar 13 Happy Pi Day with MoMath! Fri, Mar 25 Family Fridays at MoMath presented by Time Warner Cable: "Spiraling into Art and Nature"
Have you tried out for Varsity Math yet? Get your weekly puzzle fix from MoMath in the Wall Street Journal every Saturday, or check out varsity.momath.org and blogs.wsj.com/puzzle. College students: become a MoMath intern! Share your love of math with others! MoMath is now accepting applications for summer internships for current college students. Improve your interpersonal and communication skills, explore mathematical concepts, and learn valuable job skills. See more at momath.org/jobs. Please note that internships are unpaid. High school students: Intern at MoMath on weekends this spring! Last chance: This spring, high school students with a love of math can become a part of MoMath! Gain valuable experience while helping others, and add something unique to your college applications. Applications for Spring 2016 high school internships are now available at momath.org/jobs and will be accepted through the end of January. James Tanton returns to MoMath! Math educators, sign up now to join James on Monday, February 1 as he shares his innovative Exploding Dots curriculum, and see how this astoundingly simple idea can revolutionize K-12 arithmetic and algebraic thinking and teaching. Bring an extra pair of socks with you, as this workshop will knock your first pair right off! Space is limited -- register now at exploding.momath.org. Want to share the joy of math with the world? MoMath is teaming up with The Global Math Project to build a series of synchronized, annual online global events — Global Math Weeks — for teachers and their students, community groups, families, and individuals worldwide. The Global Math Project aims to reach and thrill one million people with an engaging piece of mathematics during one special week in 2017. Come meet founding team member Dr. James Tanton and learn more about this exciting new initiative and how you can get involved. Refreshments will be served. Register at global.momath.org. Enter the world of cellular automata! Popularized by Martin Gardner in the 1970s and adored by students, teachers, and enthusiasts of mathematics and computer science ever since, John Conway's Game of Life has been called the world's most fascinating one-player game. Though the rules for Life are extremely simple, the behavior of the game — exactly how a starting configuration will change over time — is impossible to fully predict. Mathematician and artist Bob Bosch will initiate us into the unexpected complexities of this early venture into the world of artificial "life." Refreshments follow the afternoon presentation of Math Encounters; arrive by 6:30 pm for refreshments preceding the evening presentation. Register at mathencounters.org. Fall in love with Unbounded! Join us for MoMath's version of Happy Hour on Thursday, February 4, from 6:00 pm to 9:00 pm, and experience the wonder of math firsthand. Explore the Museum with friends, make new friends, and enjoy a live demonstration of the math of mutual choice. Plus, don't forget to register for Irrationality, a unique, exclusive magical experience — limited tickets available, so don't delay! And everyone receives the first drink free with admission. Register at unbounded.momath.org. Rod Kimball, author of Path Puzzles and former MoMath employee, will be signing copies of his book at MoMath on Monday, February 15 from 1:00 – 3:00 pm. Learn about path puzzles from their creator and get an autographed copy. If you like Sudoku or Ken Ken but you're ready for something new, you're going to love Path Puzzles. Rod has made puzzles for Games Magazine, Reader's Digest Canada, The National Museum of Mathematics, the Unemployed Philosopher's Guild, and NPRs 'Ask Me Another'. These days, Rod tours the world juggling with the Flying Karamazov Brothers, but he's never forgotten his love of math. Join MoMath for the 2016 MoMath Masters Tournament, the exciting annual competition and charitable fundraiser. Do you have what it takes to be a MoMath Master? Get your thinking caps on for this fun-filled night, from the entertaining cocktail round right through to the challenging and suspenseful finals. Will Shortz returns as this year's host — but who will win? Space is limited, so reserve your seats now at masters.momath.org. Volumes, the MoMath book club, now includes the opportunity to mingle and meet other participants over coffee, tea, and cookies. Last month's discussion was animated and thought-provoking with participants exchanging sometimes conflicting ideas in a congenial atmosphere. This month's selection is The Silicon Jungle: A Novel of Deception, Power, and Internet Intrigueby Shumeet Baluja. We expect that the discussion on the topic of data mining will be equally engaging. No prior math or science background is necessary. Register at volumes.momath.org. Coloring meets mathematics! Start with a series of delightful images and explore their details and patterns through coloring. Then learn about the mathematical ideas used to construct them: from the incredible structure of four dimensions to seven-fold Venn diagrams, you'll be surprised how much you can learn simply by putting colored pencils to paper. Join mathematician and artist Edmund Harriss as he shares some of his favorite images from Patterns of the Universe, the stunning new coloring book he recently published with British writer and broadcaster Alex Bellos. This presentation is free to attendees, as part of Time Warner Cable's Connect a Million Minds campaign. For more information and to register, visit familyfridays.momath.org. There’s math behind the magic! MIT professor Erik Demaine takes us down a mathematical path that leads to magic, then heads back the other way to show how analyzing a magic trick can lead to some fun and challenging mathematics. His bag of tricks will include cards, coins, rope, paper folding, and even juggling as he shows us the hidden math within the magic. Register at mathencounters.org. Meet Rich Wilson, an experienced sailor whose 121-day passage solo 'round the world was one of the outstanding human adventure stories of our time. Having completed several record-breaking ocean voyages, Rich is about to begin training for the next edition of the Vendée Globe, the toughest solo sailing challenge there is. What's a former math teacher and lecturer doing on the high seas? Join us to find out! Registration will open soon for this not-to-be-missed event, brought to you by OppenheimerFunds. Harmonic Series: "Sam Zygmuntowicz: The Math, Science, and Art of Violin Making"
How does a small wooden box help a violinist fill a concert hall with music? Harmonic Serieshost Bruce Adolphe welcomes violinmaker Samuel Zygmuntowicz as he takes us into the hidden inner workings of the violin. The conversation will explore geometric principles of violin design that date back to the Renaissance, modern technologies that reveal everything from vibration patterns to the internal contours of wood, and how new techniques combine with violinmakers' traditional skills to make instruments rivaling the Old Masters. Zygmuntowicz gets into detail in this special presentation in which modern science meets ancient tradition. And, hearing is believing: enjoy a special performance by the incomparable violinist Daniel Phillips on both Stradivarius and Zygmuntowicz violins. Register at harmonic.momath.org. Come join in the Museum's weekend celebrations in honor of the upcoming Pi Day 2016 on 3/14/16, the one date this entire century that most closely approximates pi (which rounded to four decimal places is 3.1416). All events free with Museum admission. A short audience-participatory demonstration that will bring to life what pi is, what it does, how we know about it, and at least two-and-a-half surprising facts about pi. Check out MoMath's hula-hooping contest in honor of pi, the circular constant. You've never seen hoops this big! How far must your hips travel to twirl the biggest hoop? Pi tells you the answer. Pi-morabilia prizes for the top hoopers! Meet in MoMath's lobby but dress warmly: Rhythmic Rotations will be held outdoors, weather permitting. Join MoMath to build Apollonian Apertures, the 9-foot fractal circles-within-circles sculpture that embodies a minor miracle of mapmaking. The sculpture you help to build will remain on display in the Museum through Pi Day. Get a jump start on your reading for this third meeting of Volumes, the MoMath book club. We will be discussing The Man Who Counted: A Collection of Mathematical Adventures by Malba Tahan. And be sure to join us for coffee, tea, and cookies afterwards. Why do we see spirals so often in the world around us? What is so singular about their geometry that makes them recur in many contexts? John Edmark, inventor, artist, and professor of design at Stanford, will guide participants in constructing their own spirals, following the hidden recipes that nature uses in creating pinecones, artichokes, pineapples, and more. Along the way, you'll discover the subtle connections between these spirals, the Fibonacci series, and the golden ratio. Come and share in the beauty that has catapulted Prof. Edmark's latest video, "Blooms: Strobe-Animated Sculptures," to over 14 million views online. This presentation is free to attendees, as part of Time Warner Cable's Connect a Million Minds campaign. For more information and to register, visit familyfridays.momath.org. MoMath's newest art exhibit will focus on the work of Spanish sculptor Miguel Berrocal. What does Berrocal's work have in common with MoMath's Enigma Café? Visit this intriguing new exhibit to find out as you take in the masterful craftsmanship of Berrocal's art. Reinvent math class with Expansions, MoMath's afternoon gifted program. Featuring programs for all mathematically gifted students currently enrolled in kindergarten through 8th grade, Expansions workshops are designed and delivered by MoMath's educational team to challenge and inspire students, and to broaden their mathematical horizons. With topics ranging from fractals to cellular automata, these afternoon sessions provide an opportunity for participants to learn advanced and fascinating topics not included in the standard K-12 curriculum. Plus, your child can benefit from enjoying math together with small groups of talented and focused young scholars. Expansions offers sessions at several levels that are differentiated by mathematical experience rather than age. Admission is by application only. To learn more and submit an application, visit expansions.momath.org. Now with Tuesday options starting at 4:00 pm and 4:30 pm! Do you have a great idea for a mathematical art show? Send it to MoMath! MoMath is seeking proposals for a show in the Composite gallery, to begin approximately one year from now. Applications are open here: applycomposite.momath.org. Looking to host a one-of-a-kind event where your guests can interact with over 30 engaging exhibits? Enter a world of mathematical intrigue, but don’t worry; among all the activity, there is plenty of space for gala-worthy dinners, over-the-top birthday bashes, laser-cutting parties, and bar/bat mitzvahs. Who knew math could be this much fun? Email events@momath.org for more information. MoMath has over a dozen great programs for school groups visiting the Museum. From graph coloring to Möbius bands, bring your students to MoMath for a view into the exciting world of mathematics, and see why kids of all ages love visiting the Museum. Register for a trip at fieldtrip.momath.org. Thanks to the support of companies including OppenheimerFunds, Google, Con Edison, and Two Sigma, as well as some generous MoMath friends, support for Title I schools is now available. To register for a free trip this year, visit titleone.momath.org. Interested in sponsoring a field trip? Email admin@momath.org. Become a member today, and help ensure that MoMath continues to deliver exciting and engaging math programs for all ages. Visit momath.org/join to become a member, and receive unlimited access to MoMath's innovative exhibits, plus discounts in Additions, the shop at MoMath. Become a premium member and receive early notices and invitations to exclusive MoMath events. Join now, and take advantage of MoMath's low rates. To learn more about long-term memberships, call (212) 542-0566. Interested in volunteering on the Museum floor? If you love math, would like to help others enjoy MoMath's interactive suite of exhibits, and are willing to devote two four-hour shifts each month, please send an email to jobs@momath.org with the subject line "MoMath integrator." Please include a cover letter, current resumé, and a newly-written essay that, in approximately 150 to 300 words, describes an experience that shaped your love of mathematics. To manage your email preferences or unsubscribe, please click here. Why are your math students struggling? Use the Coherence Map to address gaps in background knowledge. Many times, students struggle with grade-level content because they are missing prerequisite skills and knowledge from earlier grades. If your students are having trouble mastering a particular standard, use the Coherence Map to see how that standard is connected to other standards within and across grades. 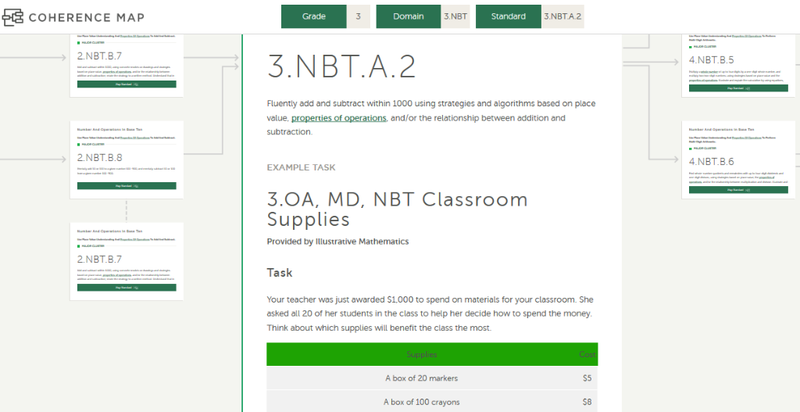 Once you've identified what skills and concepts students need to practice, use the Illustrative Mathematics tasks included with each standard to build mastery. You're receiving this email because you signed up for resource update notifications on our websiteachievethecore.org. Receiving this message from a colleague? Subscribe here to receive emails like this one. ORIGO Education is excited about our first Grant Initiative. This program will assist underserved schools who are interested in dramatically improving their elementary mathematics instruction. The grant will provide resources to aid in piloting Stepping Stones for one school year. To find more information on this exciting initiative visit our website today! The deadline to enter is April 30, 2016. The Presidential Award for Excellence in Mathematics and Science Teaching (PAEMST) – is the highest honor bestowed by the United States government specifically for K-12 mathematics and science (including computer science) teaching. Awardees serve as models for their colleagues, inspiration to their communities, and leaders in the improvement of mathematics and science education. Anyone--principals, teachers, parents, students, or members of the general public--may nominate exceptional mathematics or science teachers who are teaching grades K - 6 for the 2015-2016 school year. Secondary school teachers (grades 7-12) will be eligible to apply during a future cycle. Teachers may also apply directly at www.paemst.org. Nominations are being accepted now through April 01, 2016. Completed applications are due May 01, 2016. Contact Charlene Tate Nicholswith any questions. James Tanton returns to MoMath! James Tanton returns to MoMath! Math educators, sign up now to join James on Monday, February 1, as he shares his innovative Exploding Dots curriculum, and see how this astoundingly simple idea can revolutionize K-12 arithmetic and algebraic thinking and teaching. Bring an extra pair of socks with you, as this workshop will knock your first pair right off! Space is limited -- register now at exploding.momath.org. Focused. NCTM Institutes are an opportunity for deep learning on a specific topic. Join us in Dallas to get hands-on with the research-based strategies detailed in Principles to Actions. Collaborative. With three grade-band specific Institutes - each featuring individual focus strands - and a fourth Institute with content developed specifically for administrators and school leaders, you'll have the opportunity to share your most successful teaching strategies with peers and learn what works for them. Respected. Keynote speakers include several Principles to Actions co-authors, and all facilitators and presenters are recognized in the field of math education for their leadership and innovative thinking. Practical. You'll gain classroom-ready strategies with the potential to transform teaching practices to meet rigorous standards. Effective. Return to your classroom, school, or district with insights, tools, and practical strategies that can immediately be put to use. Registration includes a copy of NCTM's landmark publication Principles to Actions: Ensuring Mathematical Success for All. Register now to deepen your knowledge of how to implement high-quality standards for mathematical education in your classroom and school. 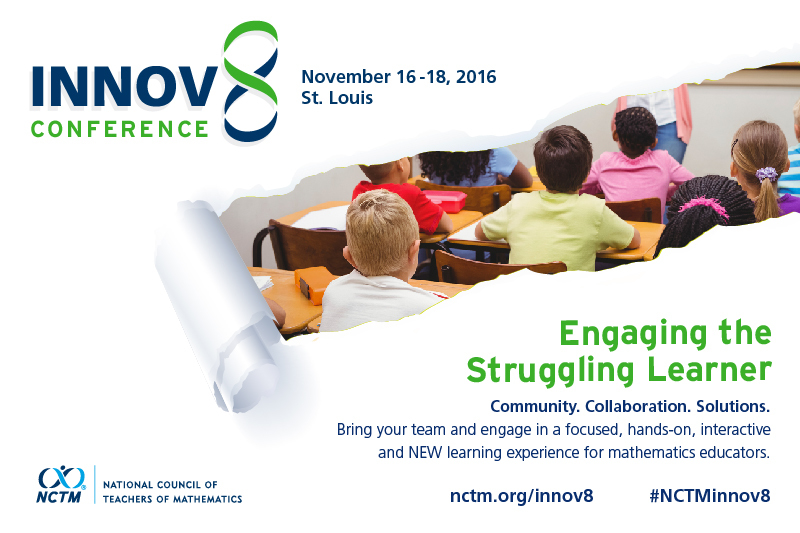 Preregistration is required for the NCTM Winter Institute. Registration closes January 29 and on-site registration will not be available. Make your reservations at the Hyatt Regency Dallas at Reunion, the official headquarters hotel, and be entered to win a free night's stay! To qualify, simply make your reservation through NCTM's housing reservation partner Wyndham Jade before January 11. Wyndham Jade will notify the winners via email no later than January 21. Taking Action to Ensure Mathematics Works for All! This presentation will discuss the six principles in Principles to Actions and outline actions to overcome obstacles that have traditionally stood in the way of making mathematics work for all students. This session will use the ideas of identity and agency as a framework for discussing the obstacles to implementing the Access and Equity Principle. This session will focus on the eight research-based teaching practices that will support the enactment of ambitious standards for all students. This session will discuss examples of each research-based practice fromPrinciples to Actions, as well consider specific ways to help teachers learn and refine practices. Don’t miss the inaugural meeting of Volumes, an exciting and stimulating book club for lovers of math, science, and literature. Join us at 6:00 pm on Thursday, January 21, to talk about The Housekeeper and the Professor: A Novel, by Yoko Ogawa. Learn some math along with the characters in the book and find out how numbers can bridge a seemingly hopeless divide and become a tool for communication in this exquisitely written tale. MoMath is delighted to announce that Volumes will be moderated by Alice Peters, a mathematician who has been involved in publishing for many years. Alice is the co-founder of A K Peters, Ltd., a publishing company dedicated to making science accessible, both on the research as well as the popular-science level. Copies of the book are available at Additions, the shop at MoMath, online at momath.org/shop, or from your favorite bookseller. Bring your own food or purchase a meal when you register at volumes.momath.org. Join a giant and unique group performance spectacle! Stand with your fellow math enthusiasts to “highlight” the Winter Solstice in a way only MoMath could dream up — Solstice Stars! Together, we’ll create a spectacular display — a glowing human heptagram, or seven-pointed star — that wonderfully integrates geometry, light, and the environment around us. Plus, watch the entire event unfold from above, thanks to a webcam mounted atop the Flatiron building that will transmit images directly to your phone in real time. Come light up the night skies of Manhattan with us! After the event, we'll cap off the evening with warm treats courtesy of DAVIDsTEA. And you can help others have a warm holiday experience by bringing a can of food to donate to the Flatiron/23rd Street Partnership's food drive. Come dressed to the sevens in your starriest attire! Please note: only the first 340 registrants are guaranteed a role as Light Bearer, so don't wait to register! Learn more and register at solstice.momath.org. The Connecticut State Department of Education (CSDE) is offering this conference to support teachers in the implementation of the model curriculum for Geometry and Algebra 2. Intended Audience: High School teachers using the state model curricula and math curriculum coordinators.